The Hershey Company announced the official launch of its new Hershey’s Gold bars, the fourth flavor in its 100 year history in celebration of their official sponsorship of the United States Olympic Committee. Interestingly, there’s no chocolate in the new Hershey bar. 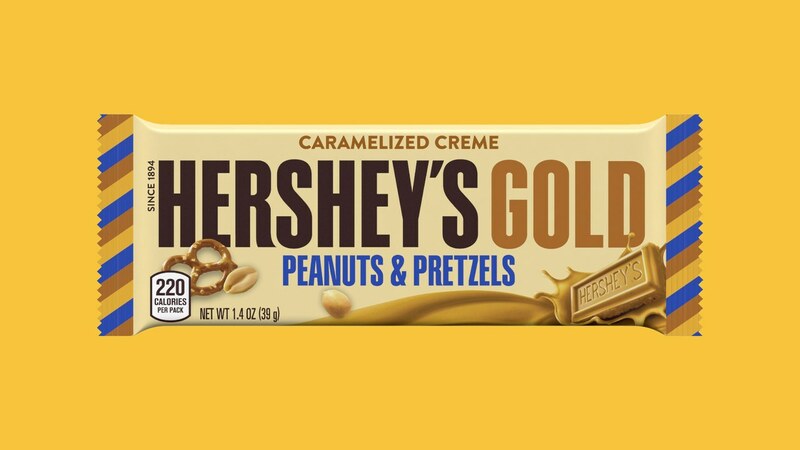 Instead, Hershey’s Gold is a caramelized creme with salty peanut and pretzel bits for a sweet, buttery taste that is topped off with a creamy and crunchy finish. “The buttery, sweet taste of Hershey’s Gold bars provides an entirely new way for consumers to enjoy our brand,” said Melinda Lewis, senior director/general manager, Hershey’s Franchise at The Hershey Company. “We use a proprietary cooking process to transform the white creme into a golden bar by caramelizing the creme, which helps maintain a sweet, creamy taste. The launch of Hershey’s Gold will introduce Americans to a new flavor and a new experience unlike any others before.” The new bars will be available for purchase starting December 1.